We have a brand new behind the scenes photo from Disney's upcoming live-action remake of The Lion King. It's going to be a busy year for the Mouse House when it comes to these remakes, as this is just one of three set to hit the big screen in 2019. Before Simba gets his day, we're going to see Tim Burton's new take on Dumbo and Guy Ritchie's Aladdin, which recently debuted its first trailer. 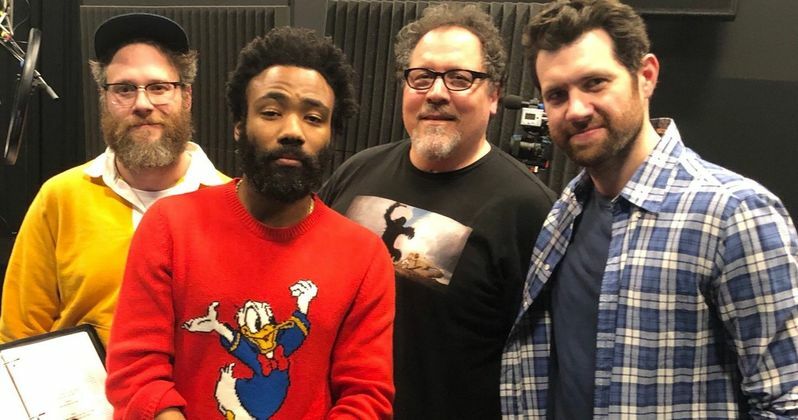 Speaking of Simba, this new photos features Donald Glover, who is voicing the character, gathered together with some of his best pals from the movie. Director Jon Favreau took to social media to share the image, with some of the cast gathered together to record some dialogue in the studio. Donald Glover is seen with Billy Eichner and Seth Rogen, who are voicing the meerkat and warthog duo of Timon and Pumba, respectively. They all look quite happy to be there and the fact that Glover is rocking a Donald Duck shirt is just a nice, added little touch. It's also interesting that they're all gathered together. Typically, voice actors in movies such as this will record their lines separately. It looks like Favreau may be trying to capture some magic between Simba, Timon and Pumba with them all interacting together. Jon Favreau has been hard at work on this reimagining of The Lion King for some time now, which came in the wake of his very successful live-action take on The Jungle Book. The same technology will be implemented for the animals in this modern Disney update to the animated classic, which means it should look absolutely stunning. But it also means it technically won't be live-action, since there won't be any human characters in it. It's going to be mostly CGI. It's just going to look real. Other members of the voice cast include Beyonce (Nala), Chiwetel Ejiofor (Scar), John Kani (Rafiki), John Oliver (Zazu), Alfre Woodard (Sarabi), Keegan-Michael Key (Kamari), Eric Andre (Azizi) and Florence Kasumba (Shenzi). Most importantly, James Earl Jones will be reprising his role as Simba's father, Mufasa. Jones is the only cast member from the original animated movie to be reprising his role for this new version, but if they only were going to bring back one actor, he was easily the best choice. Hanz Zimmer will also be returning to provide the score and he's working with Elton John on the songs that will be featured in this remake. At the present time, Jon Favreau is incredibly busy, as he's also the driving creative force behind Disney's upcoming live-action Star Wars TV series, The Mandalorian, which recently started filming. So he's pulling some big-time double duty right now. The Lion King is scheduled to hit theaters on July 19, 2019. Hopefully, we'll be seeing a teaser trailer sooner rather than later. Be sure to check out the new behind the scenes photo from Jon Favreau's Twitter account for yourself below.